Why even have blog categories? How many categories should you have? Signing off and toasting: To a better categorized health blog. So, before I give you things to consider when choosing your categories, it’s important to understand what their purpose even is. 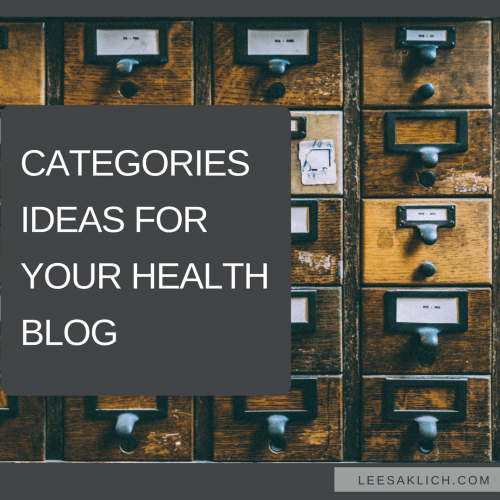 So, let’s keep these in mind when deciding on categories ideas for your health blog. Not having any categories may be OK if you don’t have many blog posts, or focus on one type of post on one topic. It may also be OK if you don’t sell many different types of products, programs, or services. But, once you have a few different areas you blog about, or more than one thing for sale, you should consider creating blog categories. Many of us are experts in a few, often related, areas. And it is these areas of expertise that people will be coming to your blog for. For example, low sugar recipes may be your area of expertise. But, you can break that down a bit for readers who may want to know more than just recipes. Perhaps they’re interested in sugar cravings, sugar substitutes, or blood sugar balancing. If these are in your realm of expertise, then you can consider making them each a category. Be careful not to include too much detail, you don’t want to start a category if you’re not going to have a bunch of posts on that topic. And before you do that, let’s consider #3. What products, programs, and services do you offer? Do you have blog content that aligns with each of those exact things? For example, if you sell a low-sugar recipe book, 30-day low sugar challenge, and one-on-one blood sugar balancing coaching – you should have blog content around each of those things. You can have posts about the benefits of, educational info about, and recipes included for each offering. In this case, you should consider categorizing your blog posts based on what you offer. If you’re planning to offer something new soon – then include it as a new category. But, ultimately, what you blog about should align with your expertise and offerings. A lot of new research on user experience (UX) is leading people to simplify their site navigation. This means, the fewer the categories, the better! Until today, I had 13 categories. Thirteen! And some had just one post in them. Some were created for services I don’t even offer any more. After much thought, I decided on just four categories that relate to my areas of expertise, and my current products, programs, and services. And all of my offerings fall into one of those categories. So, most of the posts I’ve created in the past 6+ months (and ALL of my posts moving forward) relate to at least one of these. These are my three main categories. NOTE: Some of my blog posts apply to more than one category. That’s OK because I choose one as the “primary” category for that post, and keep the other(s) as “secondary” categories. This means that some posts (with more than one category) will show up when a reader filters by either of those categories. Yes, it may come up twice for that reader, and that’s OK! Make sure that each blog post has a call-to-action (CTA)! It doesn’t have to be unique to that post, but you can make it unique to that category. 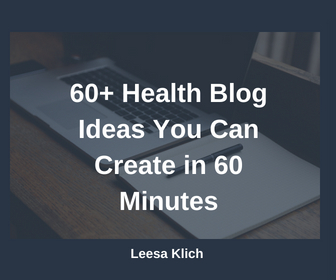 This way, someone who is interested in health content creation will get the opt-in for 60+ different health and wellness ideas. And someone who is interested in research & credibility will get the opt-in for my list of credible health resources. Bonus points for including a promotion of that offer underneath (and inside) that opt-in incentive! What about the posts in the category for the new offer you don’t have yet? If you don’t have an opt-in incentive yet, have readers opt-into a wait list to be the first to be notified when it becomes available! Maybe even offer an early bird special price or bonus. Now that you have an idea how to categorize your blog posts, you can use them strategically when planning your editorial calendar. Don’t have an editorial calendar yet? Download mine (no email address required). Alternate between categories. This helps to keep each category fresh, and allows readers to see different types of posts on a regular schedule. This also helps to make sure you have about the same amount of content in each category (if that’s important to you). Plan monthly themes based on promoting just one of your offers at a time. So, if you want to promote your 30-day program during the last week of March, plan to create posts in that category for that month. For your blog to grow your business, you need to think about which categories are best. Pay special attention to aligning categories with both your current offerings, and what your readers are looking for. Don’t forget to make them as simple as possible, and have a related call to action (e.g. opt-in) for each category of posts. What do you think? Do you and your readers love your current categories? Do you have any categories ideas to add? This information and strategy plan for content creation has just simplified so much in my mind and made things so much clearer. Thank you so much for this tip!! The amount of blog ideas I’ve had swirling in my mind have been too many that I haven’t gotten any out because there’s been no plan and I just feel in overwhelm. But to write about everything around the products and services I offer, although seems like a ‘Duh’ moment was my ‘Aha’ moment! Thanks Leesa!